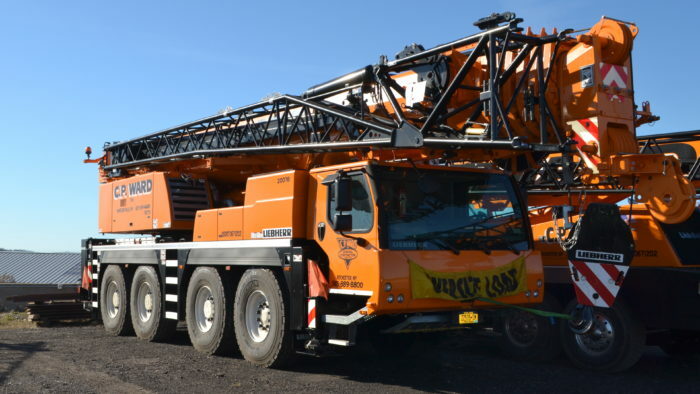 Our fleet includes cranes and support equipment with hoisting capacities from 28 to 350 tons, along with the required licensed personnel to provide safe lifting services. We pride ourselves on providing, not only competitive rental rates, but also a user-friendly workforce whose daily mission is to get the work performed safely and efficiently. Our professionally trained staff ensures that we work in compliance with all regulatory agencies. We also provide professionally engineered lifting plans, where required. Crane services we provide are to accommodate our customer’s needs and requirements. Let C.P. Ward Crane provide the equipment and rigging needed to safely complete any job. Rigging with the 10 ton carry deck crane or from our fleet of cranes from 28 ton to 350-ton crane. C.P. Ward Crane has spreader beams and rigging for any crane lifts as needed. We have a skilled group of employees willing to inspect your job and provide a quote. We can provide the traffic control and acquire the permits needed for the crane setup. Call us for a quote or to have us come check out the scope of your job.